A cat helped spare a family in the US state of Indiana from death by carbon monoxide poisoning by jumping on the bed and meowing wildly as fumes filled the home, the owners said. 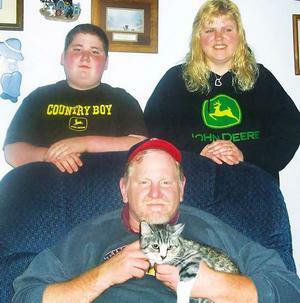 Eric and Cathy Keesling said their 14-year-old cat, Winnie, played a crucial role in saving their lives on March 24 after a petrol-powered water pump in their basement caused the odourless, but deadly, gas to build up. About 1am, the domestic shorthair began nudging Cathy’s ear and meowing loudly. “It was a crazy meow, almost like she was screaming,” said Cathy, who hesitated to get up until Winnie’s wailing and jumping persisted. When she finally climbed from bed, she realised she was nauseous and dizzy and couldn’t awaken her husband. Because he had undergone minor neck surgery the previous day, she decided to call 911, but was so disoriented she had trouble dialling. Paramedics found the couple’s 14-year-old son, Michael, unconscious on the floor near his bedroom.The Keeslings were taken from the home in oxygen masks, treated for carbon monoxide poisoning and soon recovered. Cathy Keesling said Winnie acted similarly last summer when tornadoes tore through the area, 72 kilometres east of Indianapolis. “I really believe cats can sense these kind of things,” she said. Animal intelligence? Probably more likely a case of a cat that was experiencing some of the same discomfort that the family felt, and was doing it’s best to say, “Hey, doggone it, I don’t feel well.” Still, there’s something to that. There are 2 reader responses to "Cat Saves Family from Gas Poisoning". What a beautiful story! It’s always amazing to me how connected to us our pets are, and the different gifts they area given such as this cat’s ability to detect the poisonous gas and not just to save herself but to work hard to save the family. wow i love this story its so amazing it was the best cat that you could not see your eyes i bet it was just so amazing to you just so wonderful!! !